Another year flown by and in some ways not a lot has happened but in others it has. Our membership stays stable as people leave but then new ones join so it is mainly constant. We lost one member of the committee through resignation, which currently stands at 9, this is not enough if we wish to keep the flourishing committee we would like. We hope to welcome a new member this coming year who has already proved herself to be a very useful member taking on the Twitter account which has lain dormant since Owen left us a couple of years ago. These days life is led in the Social media, namely facebook, Twitter and the World Wide Web. We try to keep up to date but it would be great to have more help and different people having input, so few can only do so much. We are lucky in our Treasurer, Rob Murphy, who keeps us up to date and has finally got us signed up for Gift Aid, hence you all receiving new forms to complete, I would urge you to please do this for us even though you may have completed one in the past, we are starting afresh as Rob has no idea with the forms we currently have who is still eligible and who, without a lot of work searching, is still a CS member. It is annoying that we cannot make our Santander account online as until the bank decides to send us a statement we have no idea how much money is in there, it is a most unsatisfactory place to be, we now ask people to sign up with our account at HSBC where we can see online banking at the flick of a button and can pay into an actual bank with cash, which we cannot do with Santander as it is a postal account, makes our lives a lot easier. After members subs have gone into the Santander account, we write a cheque to move it into HSBC, we keep hoping that because there is no movement on the account, only now once a year, that they will write to us to advise they are closing it. If this does happen, we will have to ask you to move your standing orders anyway, so it would be helpful if you could do this now your current Sub has gone into the account, if you do it now it will be from October next year, October 1st 2018, please consider helping us by doing this for us. Thank you. Our meetings have been well received, some better than others. The November talk on Recycling was replaced last minute by a talk by Mike Spencer, Director of Attenborough Nature Reserve, very, very popular talk and he will be coming back again in the New Year to talk to us about another aspect of Attenborough Nature Reserve. I missed the January talk by Elain Harwood of English Heritage on Brutalist Architecture but it was very well attended and enjoyed. In March Jason Mordan also gave a very interesting talk on Heritage at Risk, Building Conservation in Broxtowe, some problems and opportunities. Peter Robinson organised a meeting in April entitled Beeston: 30 years into the future. We had quite a large panel of speakers and there will be an update on that talk at the AGM on Friday 13th October. An extra talk was put on in June so we could invite Wolfgang Buttress to talk to us about The Hive situated in Kew Gardens. So we knew what he was talking about, I organised a coach trip to see the Hive which was just incredible, it made his talk far more interesting to those of us who had actually seen it and could ask intelligent questions about it. We learned that it is and will remain, the only one, that it will be at Kew for at least the next 12 years, that The Duke of Devonshire wanted it for Chatsworth after it left Milan but didn’t get it –shame as it would be good for ‘we who live in the North’ as far as London is concerned – it may yet go there, no commitments for it yet I don’t think! People enjoyed the Kew trip so we have just had another trip to Hampden Court Palace, enjoyed by all who went. I am happy to organise more trips if people want them. We continue to monitor all local planning applications commenting on those we consider to be of concern. We also attend Broxtowe’s Planning Committee meetings in a watching role. We continue to research local buildings to nominate as non designated Heritage Assets, help is always needed and welcomed to do this. We also attend Council workshops on various issues, Chetwynd being one of them. We have responded to the Government Consultation on the future of East Midlands Rail Franchise. We will be responding to the Local Plan Part 2 which Stefan Saunders will be coming to talk to us about at an extra coffee morning on this Saturday 14th at The White Lion. We will be offering to help the Council with the Consultation on the future of the Town Hall. There is interest in the fate of the building from outside Beeston including C20 Society. We have also encouraged the Council to have a policy on HMO’s in view of policies in place in Nottingham City. This is mainly for the protection of occupiers as well as amenities of local residents. No reported progress so far. Caroline Penn has become a member of the Friends of Beeston Station, reporting on the state of the station building to Network Rail and the Councils Enforcement Officer. This group has been successful in getting gutters cleared and plants removed from the canopy EMT are upgrading the waiting room/ticket office. This report is about looking back not looking forward but there are some excellent talks booked for the coming season, 2017/18 thanks to Caroline Penn who has done sterling work booking then chasing people up for confirmation that they are actually coming. We attended the opening of the Heritage Canalside Museum, what an event that was! Over 2000 attended, they were quite overwhelmed by the crowds, we had our stall there and spoke to a lot of people. Once again we took part in the Beeston Carnival, always a good event for Beeston folk to enjoy, a very successful affair, enjoyed by many people. We have had a new Editor for our Newsletter and it has had a facelift, some good articles, not many societies still do a paper newsletter so I feel this is one of the bonuses for our members, much as it would be easier for us to just to email it out to people. The Blue Plaque Booklet has had another print run, this time 5000 and all paid for by donations thanks to the hard work by Peter Robinson. Half of these are kept by the Nottingham Tourist Board. Jonathan Tate, our designer of the BP Booklet and also the HOD booklet, took it on himself to design a BP walks leaflet, again this has proved very popular and although the Nottingham Tourist office had an initial supply they now have the pdf so they can print out maps for visitors when they ask for a booklet. Thank you to Jonathan is due. Thanks must go once again to Professor John Beckett for his series of walks which take place through the summer when we do not hold public meetings in the evening. These are very well attended with 40 or so people joining him to hear about Beestons History. And so to HOD, now run by a separate committee to whom thanks are due for all their hard work in making it even bigger this year, still one of the largest in the country I believe so well done everyone. 10.000 booklets were printed and distributed around the area from Wollaton and Strelley to Stapleford and Attenborough, truly an inclusive district affair. People are still needed to help with this committee which comprises few people and would benefit by more joining it. Please contact them through our Gmail account, addressed to Eileen Atherton, at beestoncivicsociety@gmail.com if you would like to help. It is not a 12 month commitment like being on the CS committee is. If anyone has any comments to make about this year’s events please email us with your views, be great to have some comments to put in the next newsletter. We have now moved back to the Library, newly refurbished with a larger room for us, the room being the main reason for us leaving there for the Pearson Centre. Because of the layout having a kitchen in the room, we are once again offering refreshments. We are now open from 7pm for refreshments and chat, this is to enable us to start promptly at 7.30 and more importantly finish at 9pm. One of the best things about the Pearson Centre was the ability to stay later if we were enjoying the speaker, two evenings we went on until nearly 10 pm, not so at the Library hence the earlier start. Coffee mornings continue to be sometimes well, and sometimes not well attended but those of us who are there enjoy them and sometimes stay on for lunch, it can be quite a social event. This coming Saturday 14th October, Stefan Saunders is coming to talk to us about the Local Plan Part 2, this is a really important document for Beeston, please come and hear what he has to tell us and how we can help to get the public involved in the consultation, this is the only Public meeting in Beeston there will be as far as we know so we will be pleased to welcome Stefan. 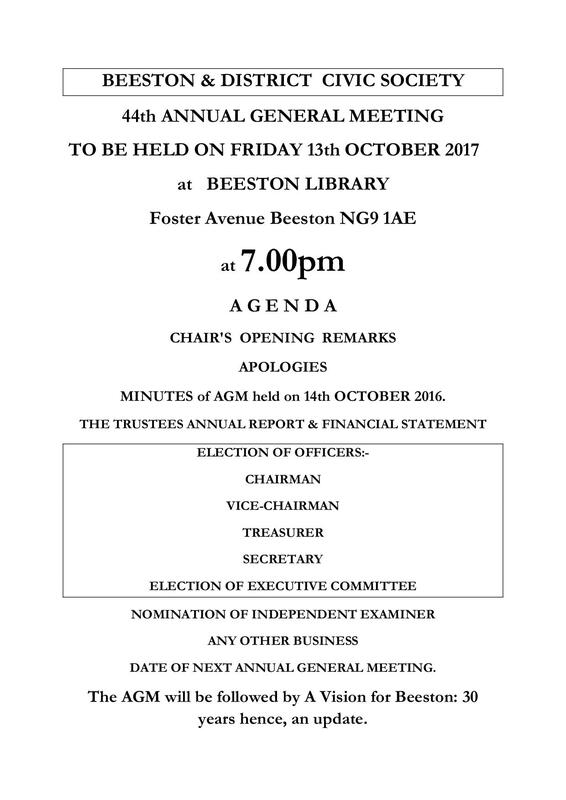 Finally, there will be an update of ‘Beeston, 30 years hence’ on Friday at the AGM. Please do join us, please think about standing for committee or at least volunteering to help, people to look at planning applications are particularly welcomed. Thank you. Judy Sleath Chair of Beeston Civic Society. CHAIRS REPORT 2015 – 16. We have had another successful year in many respects. We have had a full committee and a new Acting Treasurer, Rob Murphy, joined us in the Spring. The Talks at The Pearson Centre have on the whole been well attended and of varied interest to our members, we try to keep as near to our interests as possible but will always welcome suggestions for a speaker new to us. We have had representatives from the Planning Department, Nigel Adams from the Hope Church also a Transport Talk where 13 different companies were represented; we try to keep people informed as to what is going on. Other talks included Ian Harvey from Civic Voice coming along to enthuse and encourage us in our endeavours to keep track of what is happening in Beeston and James McCloskey gave a very interesting talk on The History of Chetwynd Barracks. The Coffee Mornings are sometimes well attended and sometimes not. We had a very successful one when the Broxtowe Parks and Open Spaces Officer, Chris Riley, came to speak to us about upgrading the Children’s Play area at Broadgate Park, about 40 people came along, it was a very lively morning, this was followed by him joining us at The Carnival on July 9th to do a paper consultation with the general public. We intend to invite people possibly twice a year, to come and talk to us at the Coffee Morning as this attracted a different audience who may not have attended an evening meeting, the Highfields Ranger has expressed an interest in coming one Saturday. Many Congratulations are due to the Blue Plaques Group, officially called Sothern Broxtowe Blue Plaque Group, who have been working hard for the last 7 years to get the magnificent publication out to great acclaim. The small group was initially Peter Robinson, Steven Wallwork and Robin Phillips and other Societies joined in later. The initial print run of several thousand is just about gone having been distributed mainly locally to Libraries, Council Offices, Shops and Cafes, the Nottingham Tourist Office, and other areas that have requested them. A very successful Launch and Thank You party was held at the Town Hall in July and attended b y the Mayor and other dignitaries and also Sir Neil Cossons attended and made a speech. I still hope that we may yet get a trail board organised and placed somewhere in Beeston, a tourist attraction. The HOD weekend was once again an amazing success somewhat spoilt on the Saturday by the morning rain but very well attended everywhere. It stretched from Thursday to Sunday and there were many taking in venues. The local HOD event is one of the largest in the country and we should be rightly proud there is so much to see here in our area. The HOD team comprising members of a few different Societies deserve our thanks for organising this major event in our calendar, which keeps growing and growing each year. The booklet is always very well received and this year 10,000 were printed and distributed all over the County. This year two of the team are stepping down and we need new people to come along and help, we do have a jobs list split down into sections so if you might be interested please contact us. This is not a year round job, it goes from late January to September, you do not have to be a member of any committee, just interested in HOD. I would like to thank Prof John Beckett for his organised walks, always popular, always very interesting and a highlight of our summer programme. There is always space for some fresh ideas, trips for instance? Would any people be interested in trips or are some of you too busy with U3A? Any ideas you may have for events we are always happy to hear them. We have updated the website a little bit, it now has a calendar you may find useful. We have also set up on facebook our own site called Beeston Voice, this is where people can post and we can interact with them, make comments etc. We also have our Website on facebook too. Some members have attended workshops put on by the Council and we continue to have a good relationship with Council Officers. The Planning sub- committee continues to monitor and comment on planning applications within our area of interest .Although we may seem to place particular emphasis on those in conservation areas, on listed buildings such as the Grange and the Parish Church, and large scale developments such as at Boots, Plessey we also look at those in residential areas, the Green Belt and protected open space such at Bramcote Ridge and of course those in the Town Centre. Thank you for your input to everyone standing down from the Committee. We have had new publicity materials made this summer and they look very professional with banners and new stands, also a feather flag so you can see us in the distance, particularly useful at the Carnival. Our Membership continues to grow and we invite anyone who is interested enough to join us as a member to consider getting involved in any organisational capacity, not necessarily as a member of the committee .A small but important job is for a note taker at our Public Talks so we can put this information into the Newsletter. We hope also to be asking members to help in a joint project with the U3A and Broxtowe Council researching possible additions to a list of non designated heritage assets. After a full year at our new venue, The Pearson Centre, we hope you are all happy with it, we have used a variety of rooms commensurate with the size of our expected audience. We have a had another good year! Many new members have joined us, We have spent a lot of time promoting the Civic Society at various events, the Carnival in July being a major event when we advertise the Heritage Open Days and begin to give out the HOD booklets, people are always happy to receive them to see what there is to visit this time round. Something new I started this year was the Coffee,Chat and Cake mornings at The White Lion on Station Road, a very popular place for community events. This gives members and indeed visitors a place to come informally to chat about things and just to one another, it has been very popular. We had John Delaney from the Planning Department one Saturday to talk about the consultation for phase 2 and we had over 40 people attend, this happened a couple of times and we also had a stall in the Square twice. Planning and Conservation.We are still very active in looking at planning applications and this year have made many representations to the planning committee. With the advent of the internet those meetings between CS and the planners do not happen now as the plans are emailed weekly (anyone can sign up for this) and remarks can be emailed back. From this last years AGM, we have formed 2 subcommittees, overseen by Caroline, for a)Planning and b)Conservation, more people can get involved in these sub committees, without having to be a committee member, if they so wish and should contact Caroline through our email. Phase Two. I was very disappointed that after all the hours we put in encouraging the public to complete the consultation forms regarding what the public wanted, only just over 130 were completed online or sent in. We had 3 coffee mornings about it and twice had a stall in the square. A poor show indeed. The Pearson Centre. We are now in our new venue and I hope you are all pleased with it, it is large and bright and easy to get to. We have only of course had 2 meetings there so far and we are still having slight teething problems with refreshments but I am sure these will be sorted out. I hope everyone is happy with it. Heritage Weekend was a triumph yet again and many thanks must deservedly go to the small band on the subcommittee. Two members are now standing down, Barbara Selwood and Joyce Brown and we owe them a debt of thanks for all the hours they have put in to make every year better and better, the sub committee as a whole have achieved great things and have received much praise.There was a very comprehensive booklet printed and we distributed 11.000 copies of this across the county. Once again the Chilwell Barracks visit was oversubscribed as was the trip to D10 at Boots also the visits to Strelley Hall, a new addition to our list. There were over 50 venues across many parts of our area including Wollaton and Bilborough, which asked to be included. Help is always wanted to man events and also visit and make reports on venues, if anyone is interested please contact us by email.The sub committee would welcome more people to join in to help with arrangements, we have people involved from other societies initially but you can never have too much help for occasions like these. I am sad to say that the event at The Pearson Centre was not a big success simply because of its position, having no passing public and being out of sight, a great shame because it is an excellent venue for most things, hopefully next year the event will be able to return to Bartons. Please see attached report from Barbara Selwood. Magazine. Many Thanks to Karen Attwood for the quarterly magazine, always full of interesting articles and comments. Now in colour it has brought many compliments. If any member would like to contribute anything please contact Karen Attwood via our gmail address. Website. Thanks to Owen we now have a thriving website and we also have a Twitter account. Members can join through our website and pay via paypal as indeed can any current member who does not pay by Standing Order. Any photos you have of Beeston will be gratefully received for the picture gallery. Please keep looking and send any remarks to us that you wish to make. Owen has now stepped down as Webmaster as he has been promoted in his job and can no longer give the time required to the website, we wish him well for the future and are sure he will be back. Treasurer. I am sorry to tell you that also due to pressure of work Michelle has also stepped down this time, we wish her well for the future. Nominations for Committee members. I am sorry to tell you that I am not standing again for Chair so there are vacancies on the committee for Chair/Treasurer/Webmaster/Membership Secretary and 2 ordinary members. I have attached a nomination form for any member who would like to form part of the new committee. Subscriptions For those of you who joined this year, thank you, and may I tell you that those of you who joined in June or after do not need to pay again until next October 2016, I hope you will consider doing a Standing order as this makes it so much easier for the Treasurer. Please ask at the AGM or December meeting for your National Trust ticket if you have not already had it from us. May I ask those of you who do not pay by Standing Order to pay your subscription fee at this AGM meeting or the next meeting in December. Anyone not doing so will no longer receive the Magazine and emails after December. You can send a cheque to our Secretary: 4, Penryn Cres, Chilwell, Nottm. NG9 5NZ. I will close by thanking those of you I have got to know for your support and friendship. am willing to serve as ……………………………………………………..
A core group of people facilitate (rather than organise) this event on behalf of Beeston Civic Society. It consists of Eileen Atherton, Joyce Brown, Barbara Selwood and Richard English assisted by various ‘Hub people’. This year we extended our range, partly due to Barton’s not being available as a venue, but also as there were requests to be part of HOD. Thus we had 50 entries in the booklet, including at Strelley, Bilborough, Wollaton and Nottingham University. Besides going ‘Beyond Beeston’ – we had some new entries in Beeston which proved very popular – Dagfa House School, Beeston Fields Golf Clubhouse and Oban House. A very well organised tour around Boots D10 this year was fully booked, as was the Restoration Ramble at Highfields and the Heritage Walk around Beeston. We have been fortunate to be supported by our local County Councillors, whose donations cover most of the cost of producing the booklet, and with expected contributions from the ‘Beyond Beeston’ venues, we will cover our expenses. We are looking for some new people join the Core Group, so that Joyce and Barbara can step down. We will renew our energy ready for starting again in January to get the ‘wheels’ in motion. We are very grateful to the staff and volunteers at all the venues for, without them, we would not be able to share the Heritage of Beeston and Beyond with the public. I am very sorry but I omitted 3 very important items in my report, so eager was I to get it out to all members to digest before the AGM. First of all I would apologise to Prof John Beckett for not reporting on his walks this year, I am so sorry. The walks are always well received and enjoyed by our members and indeed others who join in and they are part of our summer programme and the HOD weekend, long may they continue. Thank you John. Secondly I also did not mention the superb information maps made by Robert Howard, these have been enormously successful this summer, there were 3 versions. For those of you who have not seen one I attach to this email the one he made for us as our contribution to BID’s Freshers Weekend in September. I had 3000 of these printed and the parents of students and students themselves went wild for them, so much so that Robert has been asked to provide the pdf so they can go in the Student and Parent handbook next year. They will of course have to be amended due to some bus routes being cancelled. These maps also went to Central College, they were also thrilled with them. He also did one for the HOD weekend, purely for Beeston as his maps are of Beeston and not the surrounding areas, I did get some criticism of this from some members of the committee as other areas were left out, it was not intended as a full HOD map but a Beeston HOD map. In the beginning of September some of us were on a stall in the Square giving out the HOD booklet to passers by, but as it was early days for the tram we gave out many maps to first time visitors to Beeston, I spoke to many of these visitors myself and again they found them most useful having never been to Beeston before, many came from Hucknall and Bulwell. Thank you Robert. I also forgot to mention the Art Competition which I organised, this having happened a few years previously but then stopped presumably due to lack of support in the organisation of it. It didn’t start off very well and I was quite disheartened by the number of entries, but on the day itself it came good as people went home and returned with more pictures to hang. It was visited by many people and some good comments were written by the visiting public about it, it is worth doing again. I have already booked the library for next Spring but it seems it (the Library) might be reburbished (again?) so the date may change as of course it will be closed during this time. Finally, I would like to thank you all for your support and messages after I announced in my previous report that I would not be standing for Chair again. I have been persuaded by many that we have an exciting time ahead and this is not the time to leave, especially with a major town development coming soon and the unexpected demise of BID which will leave a vacuum, who will speak for Beeston now? I have therefore decided to stand on Friday because I want to build on the success of the past with the 6 remaining current members and 5 other Beeston supporters have also thrown their hats into the ring to stand as committee members and we can hopefully carry the Civic Society forward into the digital age with fresh ideas and great enthusiasm. We have some challenging times ahead, we need to engage in social media to reach our audience so let us all, members included, work together for the future and prosperity of Beeston. Beeston Civic Society is all about looking to the future. We have a had a good year! Many new members have joined us, we now stand at 218. I think this is down to the high profile we have had in being part of New Deal for Beeston: the official name of the group (including people from outside the Civic Society) is Continuum. We have spent a lot of time promoting ourselves and you will see from the Treasurers Report that we are down in our funds this year. This is because we were approached, as were many others, by The Hope Church to help them fund a new van for their good works. They needed the last few hundred pounds to buy a new van and in return have we our name painted on the side. To me this was a no brainer! For £400 we have our logo and name painted on two sides of the van and it flits about all over Nottinghamshire and surrounds on its collections of food from as far as Lincolnshire and is seen about Beeston area on a regular basis. Many more people now know and have heard of Beeston Civic Society! We have had some excellent speakers and well attended public meetings, we hope to continue this in our next season. We are trying to keep to talks that are relevant to Beeston and District and our interests, I hope you will agree that we have done a good job this year thanks to Eileen. We had to have an extra meeting to talk about Beeston Town Centre, we have played quite a large part in this having four of our members as part of this Continuum group. For now, whilst we wait for the new town centre to be completed there is nothing happening with Continuum although I did see in Beeston a small group of students in white coats(?) bearing the name ‘The Built Environment and Architecture’, walking around the Square recently with clip boards. For those of you who do not know, thanks to Prof Martyn Polikoff, this department has taken on the challenge, with the blessing of our council, to design a vision for Phase 2, which is the area that will be left after the tram is finally completed, (where the Fire and Multi storey carpark used to be). I am sure we all have our own vision for this but hopefully with suggested plans acceptable to the Council in place, they will be able to go to developers and say, this is what we want our town to look like, not be fobbed off with a replica of what they are re-building now! The possibilities are endless. We have done quite a few questionnaires and the main thing that comes out of them is that local people want a cinema/theatre/art space, good shops and greenery. The Blue Plaque Scheme has finally come to end with a magnificent 34 plaques now found around the area. Many, many thanks must go to the Blue Plaques committee led by its Chair Peter Robinson for all the work and research that has gone into this scheme. There has been extensive coverage in three issues of Bygones and at some point there will be a booklet with a trail. We are pleased that finally the TEN BELL has had a makeover, still in its place outside of Sainsbury’s but there is nothing we can do about that, at least it has a new plaque and had a clean up with the promise that from now on it will be looked after by Sainsbury’s. The next project the Civic Society is embarking on is Local Listing. It is for everyone to get involved in this, it is not about Listed Buildings and Grades 1, 2 and 3 but about places, houses, buildings that are a good representation of their kind and need to be earmarked. We will ask you in due course to be part of this, all it entails is walking about and taking note of what you see, the finer details have not yet been decided. Heritage Weekend was a triumph for us yet again and many thanks must deservedly go to the small band of three, Eileen, Barbara and Joyce who did most of the work for this. There was a very comprehensive booklet printed and we distributed 10.000 copies of this across the county. Once again the Chilwell Barracks visit was oversubscribed then delayed by illness but went ahead at a later date. We hope to have a talk in our next season. Beeston Carnival was very good for us and quite a few new people joined that day. We had a very interesting stand which attracted attention and we had our questionnaire asking people what they want to see happen to Phase 2 of Beeston Square. We are still very active in looking at planning applications and this year have made many representations to the planning committee. We must Thank Barbara who for the last 20 years has been mainly responsible with Caroline for meeting with the council to look at plans, she is not taking the lead on this now but will still be part of the subcommittee. With the advent of the internet those meetings do not happen now as the plans are emailed weekly (anyone can sign up for this) and remarks can be emailed back. From this meeting though, we have formed 2 subcommittees, overseen by Caroline, for a)Planning and b)Conservation, more people can get involved in these sub committees , without having to be a committee member, if they so wish and should contact Caroline through our email. Magazine. Many Thanks to Karen Attwood for the quarterly magazine, always full of interesting articles and comments. Website. Thanks to Owen we now have a thriving website and we also have a Twitter account. Members can join through our website and pay via paypal as indeed can any current member who does not pay by Standing Order. Any photos you have of Beeston will be gratefully received for the picture gallery. Please keep looking and send any remarks to us that you wish to make. We had a very successful poll about the town centre on there and the result formed part of the Councils own poll. We must mention our current venue, John Clifford. I want to ask you, the members, what you feel about it, are you happy there or would you prefer to be back in the centre of Beeston? The Pearson Centre is very central but more expensive. The Committee think that it would be worth us moving there as there are different sized rooms we could use, refreshment facilities, easy car parking (Sainsbury’s) and close by the main residential part of Beeston. The Beeston Library is not an option I am afraid, it is not large enough for some of our public meetings and there is a problem with the time of ending our meetings. We will of course need to take a vote on this. Lastly, our membership fee. This has stood at £7.00 and £10.00 for some considerable time and if the general consensus is that members would like to be back in a more central venue we will need to increase the subscription. We have looked at other comparable societies and we are quite a lot below them in what we charge, for our membership you get 8 free monthly meetings and 4 magazines per year. I would like to put forward a vote to increase the subs for next year, 2105/16 to £10 &15. If we did increase this fee, we could also make each member a member of Civic Voice and the benefits that comes from that which includes one free entry ticket to both The National Trust and English Heritage, these tickets are not limited to your use but any friend or member of your family may use it. For those of you who joined this year, thank you, and may I tell you that those of you who joined in June or after do not need to pay again until next October 2015, I hope you will consider doing a Standing order as this makes it easier for our Treasurer. May I ask those of you who do not pay by Standing Order to pay your subscription fee at this meeting or the next. Anyone not doing so will no longer receive the Magazine and emails. You can send a cheque to our Secretary: 4, Penryn Cres, Chilwell, Nottm. NG9 5NZ.